Distinguished College or University Teaching of Mathematics. Professor C. David Minda of the Department of Mathematical Sciences at the University of Cincinnati is the eleventh recipient of the prestigious Mathematics Teaching Award by a college or university faculty member from the Ohio Section. Judy Palagallo, selection committee chair, is shown here presenting the award to Minda during the recent spring meeting. The Teaching Award is bestowed on faculty who are widely recognized as successful teachers, have an influence in their teaching of mathematics beyond their own institutions and foster curiosity and excitement about mathematics in their students. Minda's nominators and colleagues at University of Cincinnati noted that these requirements were certainly well met. Minda earned both his bachelor's and master's degrees in mathematics from the University of Cincinnati and doctorate PhD from the University of California at San Diego. He began his teaching career at the University of Minnesota before returning to spend the remainder of his career in Ohio. During this time he has devoted himself to teaching undergraduate as well as graduate students, and especially to the training of future and in-service teachers. In the ensuing years, a myriad of students have had him as their professor. Many have gone on to careers in education themselves. His students invariably describe him as energetic and creative, bringing in numerous interesting examples to assist them in catching his enthusiasm for mathematics. In 1992, he pioneered a cooperative learning course for minority engineering students at his university. The results were impressive with grades improving 27%, and 67 percent of the students earning and A or B. His success led to the adoption of this program by the College of Engineering for all of their at-risk freshmen. Now, this course is offered to all calculus students. An engineering dean summarized, "His openness to this new idea and his courage to act on it have positively impacted the lives of hundreds of engineering students." One of the students wrote, "He explains things so well, the material is almost common sense. Lobby Congress to give an exemption from the ban on cloning, and produce more of him. We definitely need more teachers like him on this campus -- demanding of us and equally demanding of himself." "I learned to really explain mathematics. I feel much more equipped to help my students learn the art of proof-writing and learning mathematics, in general." "I appreciate the rigor, detail and depth you have required in my mathematical thought. I have grown tremendously in this area. I know I can't help but pass this on to my students." "Ideas and concepts were presented precisely and clearly in a variety of ways: lectures and written theorems for the auditory learner, diagrams and visual aids for the visual learner, and hands-on manipulatives for the tactile learner." 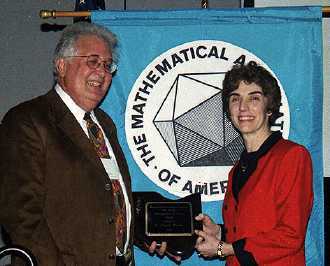 Since 1997, he (and a colleague) have conducted an NSF-funded Institute for Advanced Study/Park City Mathematics Institute program for high school geometry teachers. Through this institute, they have developed a group of nationally-recognized high school teachers of geometry who are reforming the teaching of geometry in their own classrooms. With high mathematical standards, they are nurturing teachers to excel. Minda has demonstrated a commitment to developing excellent mathematics teachers for the future. A young colleague, now a professor at Penn State University and a Project NExT (New Experiences for Teachers) Fellow, states, "He is undoubtedly the best professor I have ever had. Because of his influence, particularly his teaching, I became a teacher myself." In addition to his recognition as a teacher, he has 25 years of NSF funded research, and he has published approximately 80 papers in complex analysis and geometric function theory. His work stands as an example of how a serious research mathematician is able to contribute effectively in improving the teaching of mathematics.